We currently stock almost 2 million bricks with a range of approximately 300 types including a large number of special shapes. We enjoy an excellent working relationship with all British manufacturers and pride ourselves on our reputation for integrity and honesty. Brick Store Ltd was established in 1990 and remains an independent family owned and run business, offering a friendly and professional service. All members of staff have worked in the brick industry for many years. We moved into the current purpose built premises in 1996. The vast majority of bricks that we supply come into our stock direct from manufacturers and are delivered on transport under our control. We believe that our service is second to none. 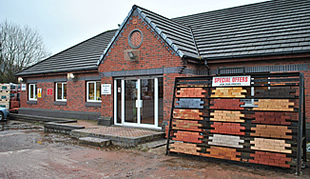 We are a true brick stockist and specialist - BRICKS it's all we know, it's all we sell. We are suppliers to the trade and are happy to supply through any builders merchant of your choice. We offer a free no obligation brick matching service within 48 Hours in the North West area. No job too big or small, we will supply them all. Get in touch with Brick Store for a professional brick supply service. © 2016 Brick Store Ltd.